Regina Holliday is painting a 20ft (6m) high mural in Washington DC. It shows her husband on his deathbed, to draw attention to the failings of the American health system. Fred Holliday succumbed to kidney cancer at age 39. He probably had the disease for years, but with no health insurance, he could not afford the tests that would have explained his symptoms. 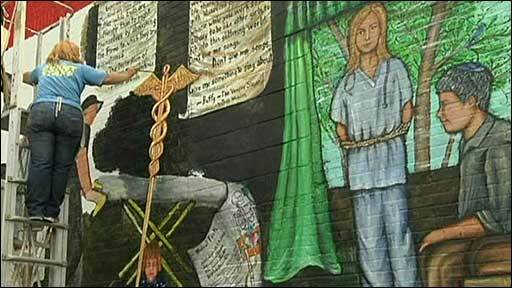 The day he died was the day the Senate health committee debate about reform began - since then, along with painting the mural, Regina has been lobbying Congress.